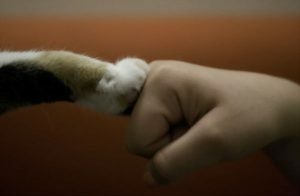 Animal chiropractic care is a holistic approach to movement and health problems. I have to share this touching video. When the owner of Sally called, she was very worried. 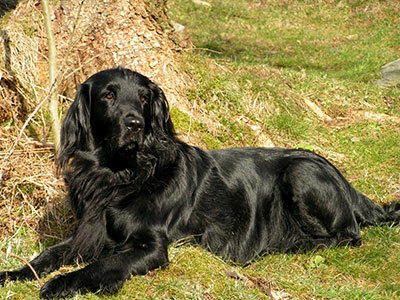 Sally is a 7 year old Flat coated retriever who suddenly seemed to not be able to walk. Her veterinarian felt that Sally had injured her low back, probably a disk injury. She was given medications for pain and inflammation and told that it might be useful to have a consultation with an orthopedic veterinarian if the medications did not do the trick. After 3 weeks, Sally ended up seeing me for animal chiropractic care. Sally is a sweet dog with a smile. Even while walking with a profound limp, dragging one paw a bit, and having significant trouble getting up after lying down, she would, of course, wag her tail and couldn’t wait for attention. We evaluated Sally and felt she had surely injured a disk in her low back. Disk injuries are extremely common in dogs, as in people. As we age, the disc tends to dehydrate somewhat and the torques of life and running with sharp turns (you know, fetching and agility dogs racing around the courses) can stress the joints enough to cause micro traumas to the disc so that over time, it protrudes into the weak areas. Often there is a small amount of arthritis in the joints around the disk involved and suddenly one day the wrong movement is just too much. Chiropractic care was extremely helpful. One thing to keep in mind, we are not forcing a joint, or vertebra, back into alignment per se, rather helping to normalize motion as much as possible to allow the healing capability of the tissues and begin the rehabilitation process. Sally was adjusted weekly for 2 weeks and the owners were given stretches and some therapies to use at home. As the inflammation subsided due to less stress on the areas involved, the pain lessened and Spirit was able to do more and more and now you would never know there was a problem. Sally visits Dr. John on a regular basis just for maintenance. Still has that smile too. The traditional approach using prescription meds is often very effective in pain and inflammation control. It does not address the neuro-musculoskeletal component of the problem. I find the combination of acupuncture and chiropractic to work so well together for these types of problems and love to work with veterinarians who are skilled with acupuncture and other so called alternative therapies. And that’s where I come into the picture! As a veterinarian who provides alternative treatments for dogs and cats, I know we are fortunate in the Asheville area to have some great alternative choices for our pets’ healthcare. Chiropractic treatment, acupuncture, herbal medicine, physical therapy, and overall holistic wellness consultations are all available and provided by trained and licensed professionals. Like Dr. Faherty, I also see patients with disk disease who experience symptoms from minor pain to paralysis. Intervertebral disk disease is very common in small breed dogs with long backs, most notably dachshunds. That is where my tale begins (no pun intended). 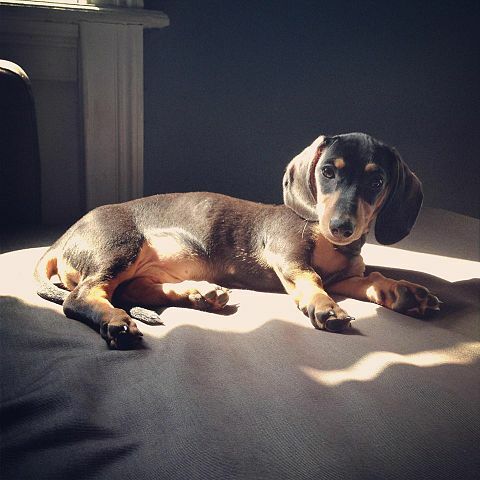 Jackson was a black and tan dachshund with a reputation. Well before his back problems, he was a “take no prisoners” kind of patient. I always heard him before I saw him. When he entered the clinic, he gave a warning bark and a show of teeth to anyone who dared entered his personal space. On this particular visit, however, he wasn’t barking. He had just returned from the emergency clinic with a grave prognosis. I entered the room and found Jackson unable to use his hind legs. His mom told me through tears that the emergency vet had diagnosed Jackson with a slipped disk, and that he needed a very expensive surgery to correct his condition. Without the surgery, she needed to consider putting Jackson to sleep. While I agreed with the doctor’s diagnosis, I suggested we try acupuncture, strict rest, and pain medication. Surgery was out of the question for this family, so she agreed to let me try. After two rounds of acupuncture and a night of cage rest, I found Jackson standing up in his cage. Not only was he able to walk, but I was his friend for life. His mom’s decision to bring him to me quickly played a big part in his recovery. He came in regularly for his “spa treatments,” and when he was ill with a bellyache, I was the only one he allowed to get close enough to give him his necessary treatments. He lived for years after his initial back problem, and most of his life was pain free. As someone who practiced traditional veterinary medicine for almost twenty years, I have a great appreciation for the doctors, medicines, and diagnostic capabilities that are available. However, sometimes when we think we are at the end of the rope, we can make that rope a little longer with alternative treatments like acupuncture and chiropractic adjustments. That’s why John and I love what we do. Dr. Beth Jones and Dr. John Faherty provide acupuncture and chiropractic services at Animal Acupuncture and Pain Relief Clinic at Sunvet Wellness at 251 Haywood St. in Downtown Asheville. Dr. Beth can be reached at 828-450-0851, and Dr. John can be reached at 828-712-8017. I borrowed a PEMF machine, and after using it daily for two weeks, my knee pain was dramatically reduced. I could exercise enough to rehab my knee without surgery. Since then, I have used this excellent therapy on many people, and, through my affiliation with several veterinary offices, am now using it with animals – mostly dogs, some horses, and some cats. PEMF is a small electric current targeting a specific area (i.e. spine, knee, neck, elbow) which induces biochemical changes that promote healing. It reduces inflammation, increases wound healing, and controls pain (including degenerative arthritis, etc.). It would be used in conditions that your veterinarian would use anti-inflammatory and pain meds. Easy to use, it is painless, and can be done at home with portable units. PEMF is non-invasive, non-pharmacological, and has no adverse effects. 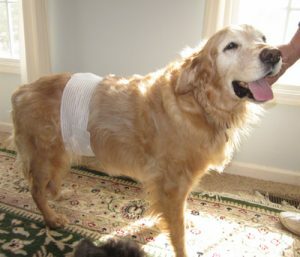 Visit assisianimalhealth.com for information on their targeted PEMF device. Their research is solid. PEMF is used on top canine athletes to lessen their post-competition pain levels; on older animals that have difficulty getting up, climbing stairs, etc. ; on post-surgical healing of ACL injuries; on rehab of operations and orthopedic injuries; on and on. Any time you might use anti-inflammatory or pain meds, consider asking your veterinarian about PEMF. One day, Remy, a sweet, older Golden Retriever was brought to see me. He was having difficulty getting up after lying for a bit, wasn’t using stairs, and wasn’t getting into the car. He seemed a bit depressed, which was understandable, because he was limited in running and he is, after all, a Golden Retriever. Daily Cosequin and occasional Rimadyl were helping, but his quality of life was definitely suffering. 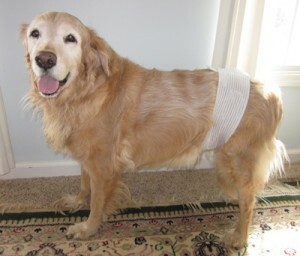 In addition to chiropractic treatment for Remy, I also recommended that the owners use PEMF at home. They did, and there was wonderful improvement! He now moves with greater ease, and has a dramatically improved quality of life. He still has some old dog problems, but Remy also has greatly increased movement and decreased pain. And his humans are joyful to see him doing so well. Ask your veterinarian if PEMF could help your dog or cat. Dr. John Faherty has been providing chiropractic care to humans since 1985, and animals since 1996. He is dedicated to helping individuals and their animals enjoy an improved quality of life as they age and recover from life’s injuries. He served for many years on the Board of Directors of the American Veterinary Chiropractic Association (AVCA). He is affiliated with a growing number of veterinary offices in Asheville, Swannanoa, and Dillsboro. Dr. John can be reached at info@animalmovement.com or 828-712-8017. Cats are such interesting creatures. They have that independent streak and are cuddly when they wish to be. The feeling of a cat lying in the crook of my arm while taking a nap is such a relaxing feeling. Cats are hunters. They are sleek, toned, alert, and agile. When something moves they notice. They can jump on high surfaces and are so light on their feet that it seems effortless. They have no clavicles (collar bone) so they are able to squeeze through spaces much smaller than you would think. Their whiskers are highly sensitive to help them locate where they are in space. They love to groom themselves and can be picky about much in their environment..
As an animal chiropractor I see some cats, but noticeably less than dogs. Cats stretch and stay limber. Their hind legs are longer in proportion to the length of their spines so jumping and pouncing are very efficient for them. When someone calls about a cat, it is likely an accident of some sort (cat hit by closing door, etc.) or an older cat. As with any quadriped, as time marches on the joints of the spine, knees, elbows, etc. all get stiff with small or large amounts of arthritic changes. Movement helps these stiff areas but sometimes is painful. When chiropractors adjust a facet joint (what we call the joints in the vertebral column), a neurological signal is sent into the spinal cord, which communicates with other nerves which inhibits or lessens the nerves that carry pain. So adjustments help allow more motion while decreasing pain. In addition, adjustments increase the range of motion of the joint involved and lessen the resistance to motion. When the nerves are free from pressure (misalignments, adhesions, tight, short, or weak muscles) the nervous system works more efficiently. If you have any questions about your cat ask your veterinarian or send me an email. Roll out the barrels, the barrels keep rolling along…. It is time for barrel racing in western North Carolina!! What an exciting, fast sport for the young and old. You ride your horse into the arena, make sharp turns around 3 barrels, then sprint out. It is timed, of course. In these parts, it is a great family and friend time as well. 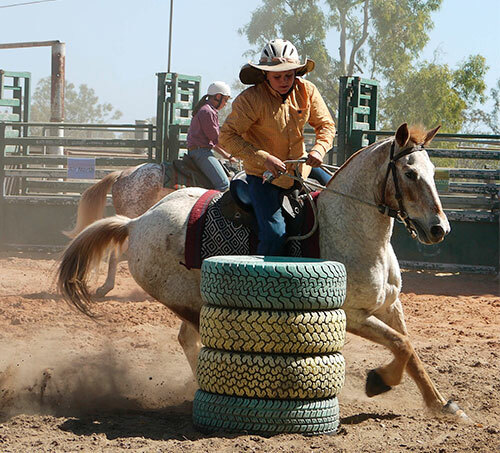 Barrel racing has certain stress demands on a horse’s musculoskeletal system due to the nature of the sport. It involves balance with the rider, balance as the horse and its momentum take it turning quickly around a barrel and running full gallop at the end. When a horse and rider approach the first barrel, the top runners are always well balanced as they approach the barrel and cut it close. The hock and stifle joints are under significant pressure as the animal leads with the inside front leg and head/neck muscles, plants its hind legs, pivots, and pushes off in the loose arena sand/dirt and sprint to the next barrel or out of the arena. Coming into the first barrel, the rider is in total communication with her horse as the animal uses its front end to make the line around the barrel. The hind end is low, planting both legs to push off as it passes the midpoint of the barrel. The front legs, shoulders and neck muscles pull to continue around the arc of motion. The hind legs push off in a hopping type movement while the front legs and shoulders pull to race to the next barrel. The center of gravity of the rider in the saddle affects the smoothness and speed of the run. The horse and rider, as a unit, lean together to keep their momentum going in the same direction. Then running for the gold at the end. It is all over in the blink of an eye. Stretching and warming up your horse if, of course, essential. It is fun to watch and when I see horse run, I watch closely with the arc of movement around the barrel for explanations of a slow time, tipped barrel etc. If it is a horse I see regularly, then an adjustment is often used to correct any imbalances prior to the second run. Sometimes the rider might also need some care and stretching. Look at the attached video of Brittany and Two Timing Lady. As they go into and around the barrels, there is a perspective of balance and pushing off. See if you can see any asymmetries, especially of the hind legs digging in and pushing off, the head veering off to one side, slipping of any of the feet or wide circles. At the events, cheering from friends and family make the energy pretty high. Both rider and horse are great athletes! I am pretty sure that I would be off the horse halfway through the first barrel. Go see barrel racing close to you. Support your local National Barrel Racing association and other associations supporting equine events. Dr. Faherty, offers animal chiropractic care in the Asheville, NC region. He is available to help animals in need and can be contacted at 828-712-8017 or email info@animalmovement.com. Dr. Faherty provides chiropractic care your dogs during agility trials in North Carolina. Contact him to find out which upcoming trials he will be attending. What can I expect at my animal chiropractic visit?